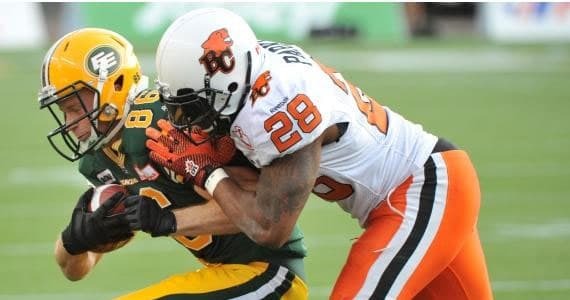 The BC Lions came into Edmonton on a roll and snuck out with a 19-18 win over the Eskimos. It was a tale of two halves with Edmonton controlling the first and the Lions dominating the second. Here is how we saw it, from the couch. The best way to describe this game is that each team won a half of football. The Lions just got one more point when all the dust had settled. The Eskimos defence was able to get good pressure on Travis Lulay in the first two quarters. While they didn’t record a sack they often hurried the Lions QB forcing him to throw the ball away or miss his targets. While the Lions offence was out of sync, the defence was again steady, although they gave up the only major of the half. In the second half the Lions defence cranked it up and the offence got on the back of Andrew Harris. Lulay once again showed his leadership and poise leading a much more efficient attack. You know your defence played pretty well when Fred Stamps has just one catch for eleven yards. Adam Bighill continues to send a message that he isn’t going anywhere as a starter in coming weeks. His pursuit of the ball and spying of the QB was brilliant. The Eskimos seem to have a good game plan when it comes to playing the Lions. In the first half Jyles had good protection and went 12-13. His throws were crisp and on target. Hugh Charles is a nice weapon and Kerry Koch had some very nice receptions including one that will be on the year end best of reel. Their defence was getting good pressure without three starters. The tide changed in the second half after the Lions started to control the line of scrimmage. It was a similar game plan to what the Eskimos displayed in the first game between the two teams in Vancouver. Regardless, the Eskimos have given the Lions a lot of problems this season. Andrew Harris carried the offence on his back with 103 rushing yards and 78 through the air. In the second half he was amazing, especially with second and third efforts that at times just bowled over defenders. His big run to set up the Simon touchdown was the turning point in the game. Harris had to carry the full load with the injury to Tim Brown, who may not be in the lineup when the Lions face Saskatchewan next week. Is it just me or was the Simon TD the same play call that Joe Burnett picked off for a TD in Vancouver? Gutsy call if so. All eyes were on Khalif Mitchell, in the stadium, on the field and on TSN, where he seemed to be the topic of the night. Mitchell was simply having his way with the Eskimos offensive line between the whistles. But the attention was once again cast his way for his antics after the whistle and before the snap. Mitchell was seen for what appeared to be throat slashing gestures on three occasions. He claimed after the game that he was making a cross. Mitchell and teammate Khreem Smith also had words on the sidelines and teammates intervened. Mitchell is an all-star defensive lineman. When he is on his game he is a force that is hard to contain. He was on Twitter after the game asking fans what they thought of TSN’s constant attention on him. If he would cut out the animated stuff and just let his play do the talking he would be getting attention in a totally different way. I get that he’s a unique guy and likes to play with passion, but there comes a point where you need to represent yourself and your teammates in a certain way. Away from the field Mitchell is a totally different person, on it he needs to learn how to reign himself in a bit. I asked for some comments during the game on Twitter using the hash tag #fromthecouch and here are a few, with my two cents in response. I’d like to make this a regular part of the blog. I wouldn’t say I was ever comfortable with Dickenson like I am with Lulay, just because of the durability difference between the two. More than giving them comfort Lulay has given them consistency at the position, which is huge in developing an offence. Absolutely, and the Lions made the better adjustments at half time. Steven Jyles didn’t complete a pass in the 3rd quarter. Good teams know how to win and the Lions have a veteran leadership group. That was the difference tonight. As far as getting the breaks, I was surprised that they overturned the Banks fumble recovery, as I didn’t see enough evidence to suggest Charles had the ball when he was down. As I said above I think they got the Johnson call right, for the same reason. That said this league really has to look at what constitutes intentional grounding, as one I thought should have been called on Jyles wasn’t, leaving them in position for a field goal which they made. I thought Kierrie Johnson had a nice return to the lineup. He was certainly a focus of the offensive game plan at times and was getting behind defenders. When Brown went down he filled on kick returns as well. His fumble was unfortunate, but I think they got that call right. Next up for the Lions is another western division battle against the Roughriders of Saskatchewan. Enjoy the rest of week 13 everyone!